Introduction: The loss of a patient to suicide is a common experience among mental health practitioners and trainees. Research suggests that younger, less experienced clinicians are often most keenly affected by the experience. Given the prevalence of patient loss to suicide and the subsequent emotional aftermath, our goal in creating a multidisciplinary suicide symposium was to provide a safe, structured environment where trainees and mental health practitioners could obtain collegial support and education to reduce the stigma surrounding patient suicide. Methods: Mental health trainees and practitioners (including medical students, nurse practitioner students, psychiatry residents, psychology interns, and practicing psychologists and psychiatrists) were invited to a 4-hour symposium. The curriculum focused on assessment of risk and possible interventions, as well as addressing the loss of a patient to suicide. Teaching methods included a PowerPoint lecture; case-based, small-group discussion; and role-play. Attendees completed numbered, anonymous surveys looking at attitudes about loss and suicide before and after the symposium. Results: Of 35 total attendees, 22 completed both pre- and postsymposium surveys. Paired t tests revealed several statistically significant increases, including increases in comfort seeking support from a colleague after losing a patient to suicide (p = .043) and comfort seeking support from a professional after losing a patient to suicide (p = .030). Discussion: The symposium appears to have had the desired effect of increasing attendees’ comfort working with patients at risk for suicide, as well as their comfort reaching out for support from others following the loss of a patient to suicide. Develop a safety plan with a suicidal patient. Identify interventions that could decrease the risk of suicide. Recognize that suicide is an outcome that is commonly encountered during a career in health care. Foster a nonjudgmental attitude/environment of acceptance and support for colleagues who experience loss. The loss of a patient to suicide is prevalent within psychiatry residency programs as well. Surveys of trainees have revealed that the greatest impact is felt in their emotional health.2 Trainees further reported that they were unlikely to utilize employee assistance programs to deal with the emotional aftermath, specifically citing concerns regarding confidentiality.2 Moreover, trainees have indicated a pervasive lack of formal institutional and departmental policies addressing the loss of patients to suicide, as well as a dearth of curricular attention to this topic. A 2009 nationwide survey of psychiatric chief residents revealed that only 19% of senior trainees felt prepared for the possibility of managing the aftermath of a patient suicide.3 This would suggest that psychiatry residency programs should consider increasing their educational offerings on patient suicide and coping with the emotional aftermath. The suicide rates and trends in Wisconsin mirror those of national data: Suicide is the tenth leading cause of death in Wisconsin, and the rate of suicide in the state significantly increased from 2004 to 2011.4 Considering the prevalence of patient loss to suicide and the subsequent emotional aftermath for clinicians, our psychiatry residency program explored this topic informally at an annual resident retreat, modeled in part on the work of Lerner, Brooks, McNiel, Cramer, and Haller.5 Our goal in creating a more formalized symposium curriculum was to provide a structured, safe environment where mental health trainees and practitioners of various specialties could obtain collegial support and education to reduce the stigma and potential isolation surrounding patient suicide. This curriculum builds upon prior work in the area, including MedEdPORTAL publications of a team-based learning suicide risk assessment module6 and a resident training curriculum in adolescent depression and suicide screening,7 by not only providing instruction related to suicide risk factors, risk assessment, and safety planning but also focusing significantly on the emotional experience of patient loss. It is this aspect of the symposium that fills an identified need for an effective curriculum to prepare learners for the eventual loss of a patient to suicide. Mental health clinicians and trainees (psychiatry residents, fellows, and faculty at the Medical College of Wisconsin, psychology interns, medical students, and nurse practitioner students) were invited via email to participate in the symposium, which was held by the Medical College of Wisconsin and sponsored by the Faye McBeath Foundation in April 2015. The primary goal of the 4-hour conference was to provide a structured, safe environment where trainees of various disciplines could obtain collegial support and education to reduce the stigma and fear surrounding patient suicide. To do this, we wanted to focus on assessment of risk and possible interventions while acknowledging the inevitability that some patients will die by suicide. Several educational modalities were employed, including priming, role-play, small groups, and large groups. The first part of the conference focused on risk assessment and intervention. To open the conference, the first portion of a large-group PowerPoint lecture (Appendix B) was delivered by a psychologist specializing in suicide prevention at the VA Medical Center in Milwaukee. The first part of the lecture focused on suicide risk factors and their assessment. A small-group activity followed, during which one participant volunteer role-played a prewritten patient scenario while the remaining six to seven group members interviewed and assessed the patient’s risk factors (Appendix C). The second portion of the large-group didactic focused on developing a suicide safety plan with a patient, including means restriction. Following this lecture segment, attendees split into pairs, with one person playing the role of a clinician and the other role-playing the original patient scenario, to practice developing a written safety plan with the participant/patient. For the second portion of the role-play, our curriculum made use of a safety plan template10 developed by Drs. Stanley and Brown (permission to utilize secured via completion of the same web-based form cited above); however, slide 12 of the Suicide Prevention Didactic also describes a step-by-step process for this activity. The remainder of the conference focused on the personal experience of losing a patient to suicide. Thus, this portion of the curriculum is not precisely reproducible, but the following components could be considered and adapted at other institutions. In our symposium, six psychiatry department faculty members who had lost a patient to suicide led small groups (approximately six members each), discussing their personal experience and answering questions. Participants wondered about the administrative process, the emotional aftermath, the effect on future practice, and further contact with the patient’s family. One faculty member spoke to the entire group of attendees about his sister who had committed suicide while he was in psychiatry training. If this curriculum is replicated or reproduced, this time could also be utilized by inviting a patient to offer his/her personal perspective on the topic of suicide. Recognizing the seriousness of the topic and the emotional difficulty that it could present, we ended the course with a 15-minute guided mindfulness practice. This activity was facilitated by a faculty psychiatrist experienced in leading group therapy sessions on an inpatient psychiatric unit. Please see Table 1 for a summary of the curricular components, the teaching methods utilized, and the time allotted for each segment. appendices for these elements, and they may be difficult to reproduce. Numbered, anonymous pre- and postconference surveys (Appendices A & D, respectively) were placed at each individual seat as part of the venue setup. Attendees were verbally instructed to complete the preconference survey prior to the start of the formal planned curriculum, and these were subsequently collected by one of the conference planners. Verbal instruction to complete the postconference survey was provided to the large group at the end of the mindfulness meditation activity. The postconference surveys were collected from the tables after all attendees had exited the venue following the symposium. Surveys were created with the goal of evaluating confidence in conducting a risk assessment and means restriction on a suicidal patient. Surveys also looked at attitudes about suicide and comfort with seeking care through questions like “I feel comfortable seeking support from a colleague/s after losing a patient to suicide” and “I feel comfortable seeking support from a family member/friend after losing a patient to suicide.” Demographic information including degree, length of time in practice, and experience with losing a patient or family member to suicide was also collected (Figure 1). 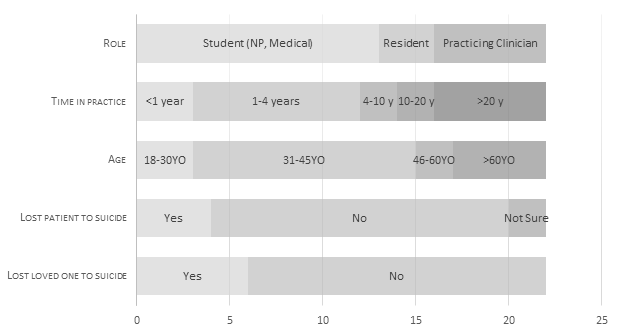 nurse practitioner; YO, years old. The Medical College of Wisconsin/Froedtert Hospital Institutional Review Board (IRB) granted an exemption from IRB oversight on April 20, 2015. The venue—a local 2,000-square-foot event room—cost $1,035, and food (both breakfast and lunch) cost approximately $500. Venue requirements included audiovisual equipment (laptop, projector, and screen), as well as round banquet tables to facilitate small-group activities and discussion. Faculty time included six faculty members for small groups (1 hour each) and two additional faculty member presentations (3 hours total). Support for statistical analysis cost $550. Thirty-five people attended the conference, 28 of whom completed surveys. Of those, 22 participants completed both pre- and postsymposium surveys. Paired t tests were used to evaluate the mean difference in survey question ratings before and after the symposium (Table 2). 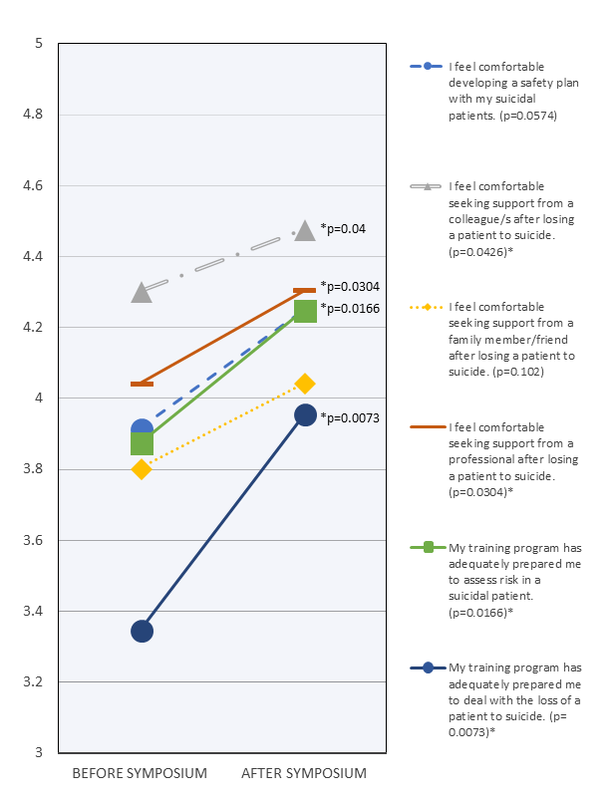 There were statistically significant increases in ratings of comfort seeking support from a colleague after losing a patient to suicide (p = .043), comfort seeking support from a professional after losing a patient to suicide (p = .030), belief that participants had been adequately prepared to assess risk in a suicidal patient (p = .017), and belief that participants had been adequately prepared to deal with the loss of a patient to suicide (p = .007; see also Figure 2). 2a. I feel comfortable developing a safety plan with my suicidal patients. 2b. I feel comfortable seeking support from a colleague/s after losing a patient to suicide. 2c. I feel comfortable seeking support from a family member/friend after losing a patient to suicide. 2d. I feel comfortable seeking support from a professional after losing a patient to suicide. 2e. My training program has adequately prepared me to assess risk in a suicidal patient. 2f. My training program has adequately prepared me to deal with the loss of a patient to suicide. Figure 2. Participant means before and after the suicide symposium (asterisks indicate statistically significant results). Furthermore, an analysis of variance was performed to determine if length of time in practice, previous loss of a patient to suicide, or previous loss of a family member/friend to suicide affected participants’ presymposium survey responses. There were no statistically significant differences in responses based on these factors. Our specific curricular learning objectives included the development of clinically relevant skills for attendees (creation of a safety plan, discussion of evidence-based interventions for suicidal patients) as well as shifting attendees’ attitudes and comfort levels in considering the emotional aftermath of such an experience. The results gleaned from pre- and postconference surveys indicate that these objectives were successfully met. After participating in the symposium, attendees reported feeling more comfortable reaching out to colleagues and professionals if they lost a patient to suicide. We attribute this positive change to the concerted effort made to provide a nonjudgmental and open environment with modeling by respected mental health professionals as they shared their own experiences of loss. Small-group discussions moderated by professionals who had lost patients to suicide were planned to destigmatize the experience. We think that this contributed to participants’ feeling more prepared to deal with the possible loss of a patient to suicide following the symposium. Additionally, attendees felt adequately prepared to assess suicide risk. We attribute this increase to the small-group practice/role-play incorporated into the curriculum. The primary limitation of this study is the small sample size (n = 35), in part related to attendees completing both pre- and postconference surveys (n = 22). Several of the metrics seemed to trend toward statistical significance, but for a larger sample size. Considering the size of our academic institution and psychiatry training programs (roughly 200 medical students, 32 psychiatry residents, and five psychiatry fellows), conference attendance was surprisingly small. Logistical factors were likely at play in terms of limiting total participation, including an off-campus location for the conference, a lack of both widespread and targeted advertising, and the elective nature of the symposium for residents and fellows. Another factor that could limit the generalizability of these results to other institutions is the inherently unique perspective of our faculty leaders. As the loss of a patient (or family member) to suicide is a deeply personal experience, the implementation of this curriculum with a different group of facilitators could potentially alter the learning experience of the participants. In addition, smaller institutions may have limited numbers of faculty members with similar experience or specific expertise, making it potentially difficult to reproduce this educational experience. Based on the positive feedback from participants and meaningful improvement shown by the analysis of pre- and postconference surveys, our institution plans to repeat a similar conference biennially. Strategies to increase attendance include hosting the conference on campus to eliminate any geographical barriers, scheduling the conference during protected didactic time for our psychiatry trainees, and advertising the event widely across campus. We plan to continue gathering data, taking advantage of a larger sample size to further evaluate the efficacy of this curricular addition. Several future considerations include significantly expanding the target audience to include other medical specialties and create a truly multidisciplinary educational experience. Losing a patient to suicide is not an experience limited to mental health professionals. A study of 22,387 suicide attempts between 2009 and 2011 showed that 64% of people who attempt suicide visit a doctor in the month prior to their attempt, with 38% presenting to a physician in the week leading up to their attempt.11 These visits most commonly occur in primary care and outpatient general medical settings versus mental health clinics. Furthermore, within specific subspecialties of medicine, the risk of losing patients to suicide can be greater than in the general population; the risk of suicide in oncology patients is twice that of the general population.12 Another future consideration is creating a companion workshop that focuses solely on the growing epidemic of medical student and physician suicide, as well as the associated topics of burnout and wellness. We intend to pursue and implement both of these goals in the near future. This symposium was graciously funded by the Faye McBeath Foundation, established in Milwaukee, WI, in the 1960s by Ms. McBeath, heir of the Milwaukee Journal Company. At the time of the foundation’s sunset on December 31, 2014, approximately $48 million had been dispersed to a variety of nonprofit organizations in southeastern Wisconsin whose work focused on children, the elderly, health, health education, and civic and governmental affairs. The authors would like to thank Michael McBride, MD, and Nathan Ray, MD, for their contributions to the 2015 symposium. This project has relied on the generosity of faculty and residents who have lost a patient and have been willing to share their experiences. Dr. Pheister reports grants from the Faye McBeath Foundation during the conduct of the study. Pheister M, Owen JR. Suicide symposium: a multidisciplinary approach to risk assessment and the emotional aftermath of patient suicide. Poster presented at: Association for Academic Psychiatry Annual Meeting; September 23, 2016; San Juan, Puerto Rico. Pheister M, Padfield E, Owen JR. Suicide symposium: a multidisciplinary approach to risk assessment and the emotional aftermath of patient suicide [an update with an additional year of data presented]. Poster presented at: Association for Academic Psychiatry Annual Meeting; September 8, 2017; Denver, CO. The Medical College of Wisconsin/Froedtert Hospital Institutional Review Board approved this study. Wisconsin Department of Health Services, Injury Research Center at the Medical College of Wisconsin, Mental Health America of Wisconsin. The Burden of Suicide in Wisconsin: 2007–2011. Madison, WI: Wisconsin Department of Health Services; 2014. Wisconsin Department of Health Services publication P-00648. Stanley B, Brown GK. Safety Plan Treatment Manual to Reduce Suicide Risk: Veteran Version. Washington, DC: United States Department of Veterans Affairs; 2008. © 2018 Owen et al.